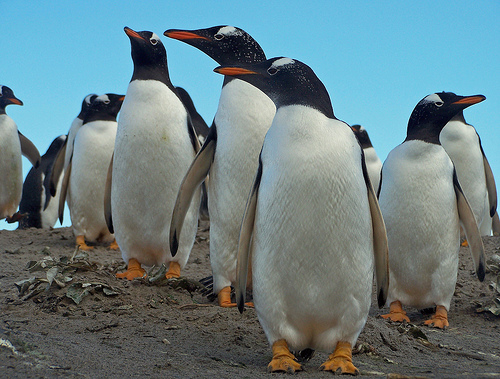 Another Google update has landed .... Penguin! This update has been designed to target web spam and focuses on questionable tactics like link schemes, keyword stuffing, cloaking and misleading redirects. Algorithm changes have been coming in thick and fast from Google over recent months. These changes have affected large slices of the web and this one has impacted particularly hard on commercially driven keywords, which historically have been known to be targeted by low quality websites. 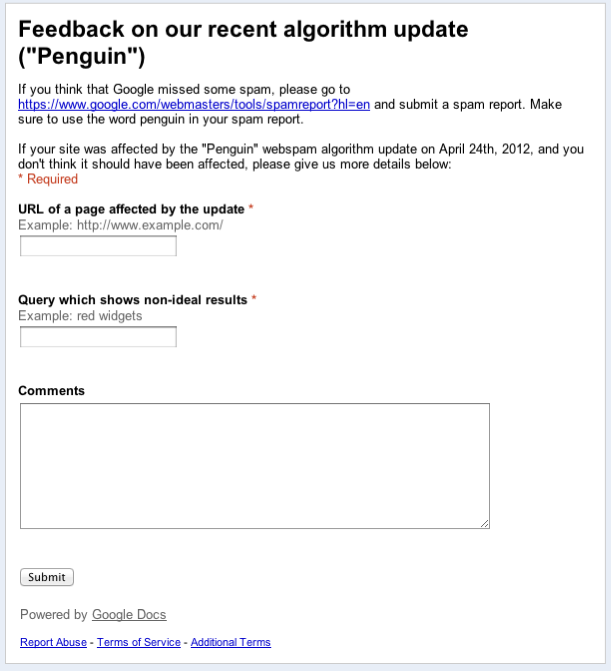 The most recent Google updates such as newly termed ‘Penguin’ which was previously known as the webspam algorithm update and related to website over-optimisation, have made it more important than ever to keep a close eye on your website health, industry activity and to safeguard against future changes. Putting a plan in place will protect your website against future updates and ensure you don’t have to break out into a cold sweat when you hear about new algorithm changes. The first thing to do is check whether your website has been affected by the recent updates and to what extent. And to get ready to do some cleaning up! The main point to stress is not to panic as a number of high profile websites such as the likes of Seer Interactive has seen some pretty funky activity in SERPs. Try to avoid making a bucket load of changes in a panic driven state as this could potentially make things worse in the long run. The best way to check for issues on your site is to run a few feeler searches for key terms within your industry which you know are good traffic drivers to your website. Also check if you are ranking for your brand terms. If you see changes in rankings for your brand terms i.e drops, then this could be an indication of something going wrong which will require further investigation! Another metric to check is the amount of pages indexed for your site. A penalty will typically show up as no pages ranking for brand name searches but levels of indexed content may still be good. It is also worth diving into analytics to check traffic levels on a keyword level. 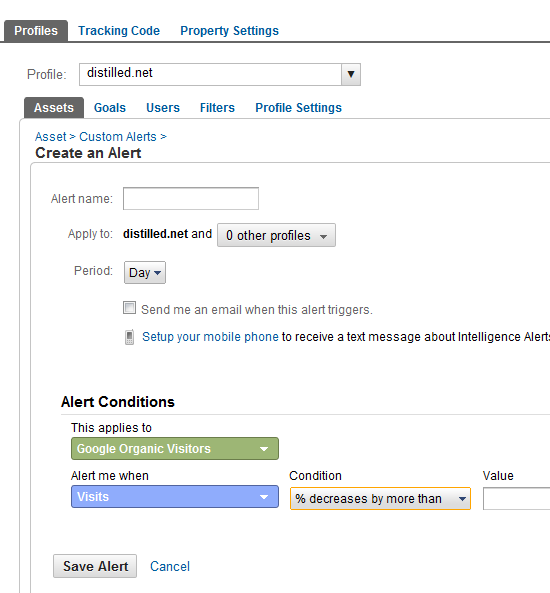 You can also use custom alerts within analytics to have emails pinged out to you if traffic drops below certain levels for specific keywords as part of your Seo monitoring. This is extremely handy, as you will know about changes in behaviour on your site fast! 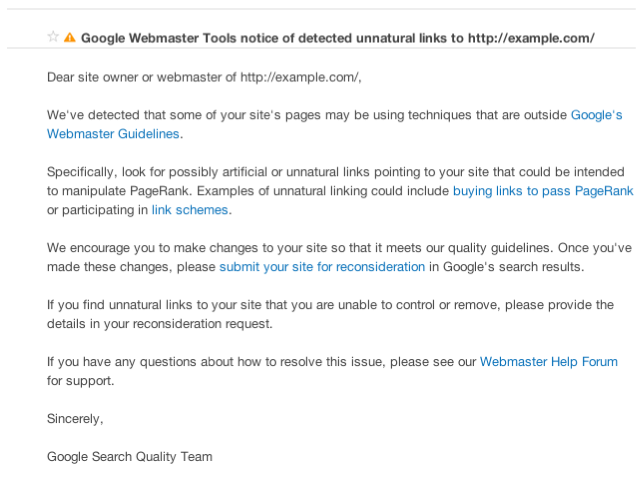 If you have received one of the 700,000 notifications sent out from Google which appear within Webmaster Tools about unnatural links, then its time to access your back link profile and be brutally honest about the quality of links you have pointing towards your site. Distribution of PageRank – You want to make sure that the PR levels of websites linking to you is evenly spread and contains small amounts of very low PageRank websites (with the exception of newly created websites). Having a back link profile which is mainly populated with links from sites with low PageRank levels is a bad idea all round and may hinder the chances of your site ranking. Link Velocity – Make sure that links aren’t being built to your website too quickly, as gaining high numbers of links quickly can easily raise flags to search engines and make your site appear as suspicious. A number of tools like ahrefs.com and Majestic Seo can be used to check historic links levels. This is also particular important to monitor currently due to the all the recent talk about negative Seo. Anchor Text of Links – Building too many links with the same anchor text can be another clear sign to search engines that something fishy has been going on. Make sure your anchor text profile is natural and that you have a nice spread of anchor text phrases. 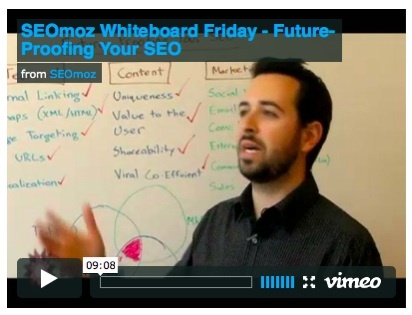 If all of your back links use the same anchor text this just doesn’t look natural can have a negative impact. A natural anchor text profile should be built up of a mix of branded, phrase and exact match anchor text which relates to your brand as well as keywords related to your website content. Quality of Linking Websites – Again it is important to honest, if you are seeing links from websites that have been built with search engines solely in mind then you can probably afford to lose these links. Common examples of this are auto generated websites with little or no contact details with lots of content that covers a wide range of unrelated topics. Or sites that have extremely low social metrics. Website Health of Linking Domains – Any sites that have been affected with malware or viruses that are linking to your website is bad news all round and should be avoided at all costs! Links that are Passing Value – It is important to remember that Google may not be crediting value to all of the links pointing towards your website so it is important to keep this in mind when removing links. Some links are going to be inherently difficult to remove but they may not be having a negative impact on your site. A super quick way to tell if a site has stopped passing value is if the sites doesn’t rank for it’s own name or brand and has very low levels of indexed content. If this is the case then you can be pretty sure all value in those links is gone. Recently a large number of link networks and associated websites have been closing down, so links which you are seeing in reports and feel are low quality may now be gone or no longer passing impact. You can mass check the status codes of the websites linking to you to see if they are still live using a number of tools like Seo Tools for Excel or Screaming Frog’s Seo Spider Tool. To mass check the status codes of your back links you can run a link report using your back link tool of choice and download to a CSV. Then upload the list to Screaming Frog using the list function and check the status codes. The most effective way to safe guard your website against future updates is to avoid doing anything even remotely suspect. If you would feel uncomfortable talking to a Google engineer about your link building activities then chances are you shouldn’t be doing them! and remove any questionable links to your website and focus on building links from high quality websites in the future. Now is as a good a time as any to put some safeguards in place, which will alert you to information about your site health. I would recommend the following precautions, which will give you more information about how your site is performing. I have recently found out about a cool feature within Webmaster Tools, which I suspect is underused. 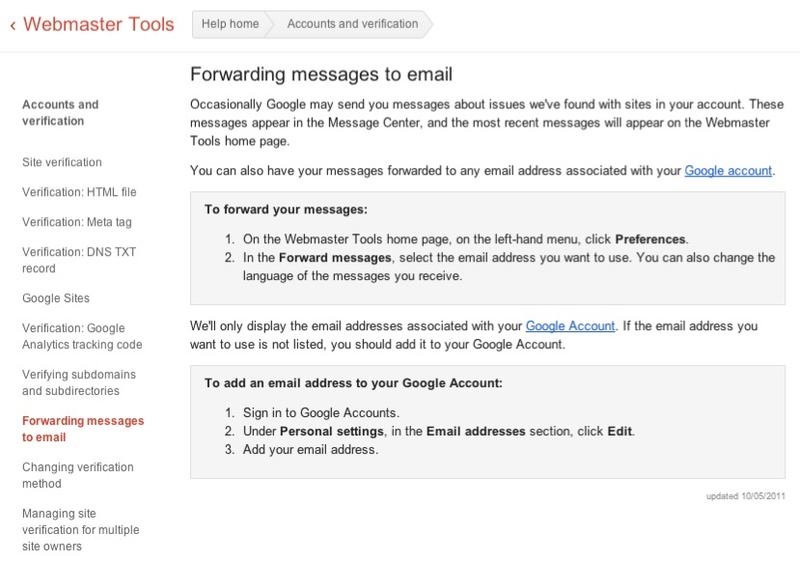 There is an option to set up email notification forwarding from Webmaster Tools to your chosen email account. Although this has been around a while it is something a few people may not know about so is worth a mention. This means that when important notifications are sent out you will find out about them fast and get more time to access the situation. This is particularly useful as the frequency of Webmasters Tools messages being sent out has increased dramatically. The custom Google alert I mentioned earlier which tells you about big changes in traffic levels will also let you know if there have been significant changes to your Google traffic and keyword levels and setup advice can be found on this blog post about Seo monitoring. There are also a number of ways you can monitor your industry to see if changes are industry wide or have affected everyone on the web. This can be helpful to monitor industry keywords and give you a quick glimpse into what chatter is happening online around your keywords. The key point to takeaway from all of the recent algorithm updates is to ensure that your activity online is future proof and to get your website into a situation that is unlikely to be affected by new changes. To make your website and online marketing future proof you need to avoid questionable activities and build links and content with the user and your website audience in mind. Examples of future proof Seo could include improving the health of your website, working towards better page speed levels and ensuring that your website is accessible for visitors on various browsing and mobile devices. Clean URLs and up to date sitemaps are also good examples of sustainable Seo that will stand the test of time. Also it would be great to hear from people in the comments that have seen good results for websites getting turned around as a result of removing questionable links.